Framelits; Soft Suede Taffeta Ribbon; Linen Thread; SU! It's time for a new challenge @ Simply Create Too & for the next 2 weeks we want to see your Father's Day or Male themed cards. I used the cute lil' Mikey image from Lacy Sunshine to make my card--another one checked off my list--& I think my hubby will LOVE this one even though he's not a milk man LOL!!!! My teammates also made beautiful creations so check out our blog to see what they created & while you're there; read up on our rules so you can play along with us! I'm looking forward to seeing your wonderful works of art....have fun & happy stamping everyone!!!!! 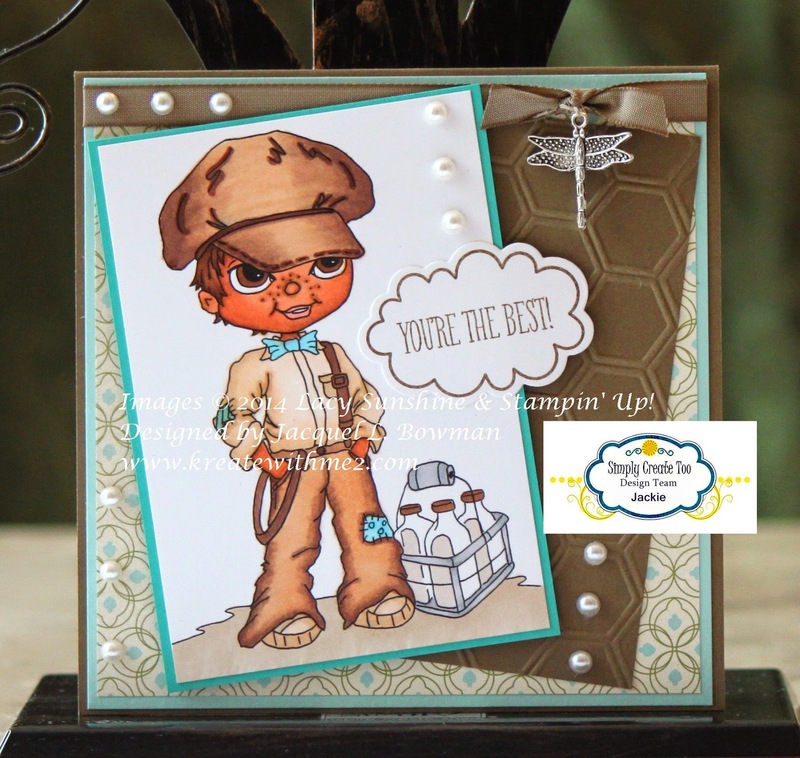 Paper Crafting Journey ~ For That Special Man! This is adorable. I like that you put pearls on this masculine card. It totally works! Jackie, this card is sooooooo cute! One of your best ever! Love the adorable image and your coloring is great! Cute! Cute! CUTE!!! I love his facial expression, he seems to be up to something! A wonderful color scheme for a male design, superb coloring! Aaaahhh, that embossing folder - I love it! You colored the hat and pants so well. Very cute card! Love the texture and how well that EF goes with the DP you used. Such an adorable little milk man. :) Wish we still had milk men! Thanks for joining us at Paper Crafting Journey Challenge and I hope you come back soon! Wow such a handsome card , Love this cute image!! Such a great guy card! Your colouring is fabulous too. Thank you for joining in the Paper Shelter Challenge this week.